History comes to life today in Scotland and England as 4 teams battle it out to win their respective national football tournament. The Scottish Cup was first held in 1873. The trophy presented to the winner of the competition is the oldest in association football and the oldest national trophy in the world. 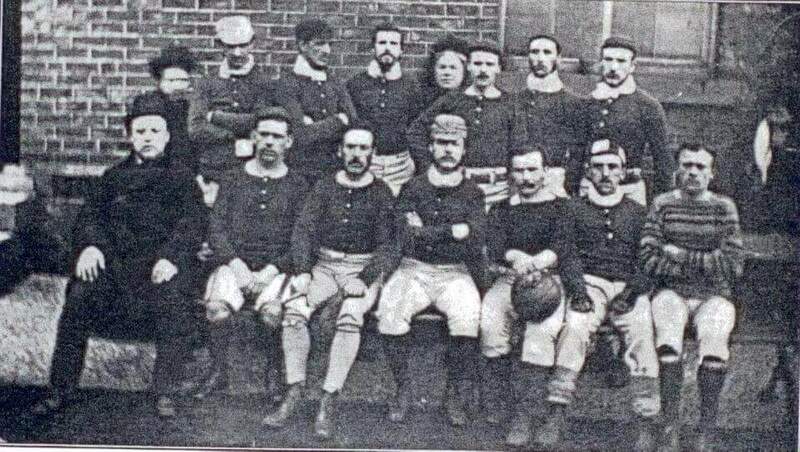 The first team to win the Scottish cup was Queen’s Park in March 1874. The first ever Scottish cup game was won by Kilmarnock, who beat opposition Renton 2 – 0. The most successful club in this competition is Celtic, who have won the worlds oldest trophy 36 times. The Football Association Challenge Cup ( commonly known as the FA cup ) is the oldest association football tournament in the world. The inaugural tournament was held in 1971. Arsenal were the winners of the 1971 tournament. Arsenal and Manchester United are joint leaders of the record number of tournament wins. Both sides have 11 FA Cup wins to their name. Congratulazioni Capri e buona fortuna! SPORTS HISTORY MADE IN ITALY!! A small town club called Capri FC 1909, formed in 2002, have gained promotion to Italy’s premier league, Serie A, over the course of 5 seasons. 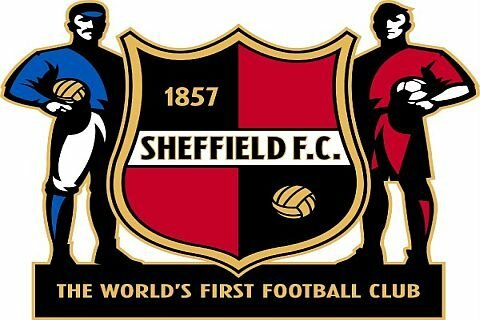 The club was formed from the ruins of the original which was plagued with bankruptcy and financial mismanagement. In the year 2010 the club played its football in the Italian fifth division to a capacity stadium of 4,144 which may cause the club some difficulties next season as Serie A rules state that a club must have a minimum capacity of 20,000. Hopefully, special exemptions will be made in honour of this remarkable achievement. At the end of the 2009-10 season, due to the numbers of teams in financial difficulty, the club was admitted into Lega Pro Seconda Divisione (Division 4). In 2011, the club obtained its promotion to the Lega Pro Prima Divisione (Division 3). Then in 2013, the club made further progressions to Seria B (Division 2). This of course was the clubs third promotion in just four seasons. 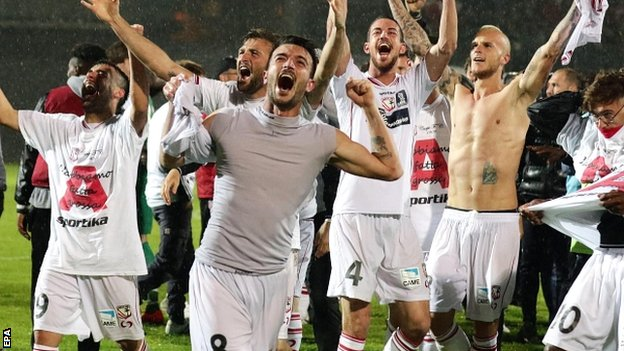 On April 28th 2015 the club reached the holy grail of Italian football and gained promotion to the Serie A where they will play the likes of Roma, Inter Milan and Juventus. Carpi confirmed their place in Serie A with four games remaining of the season after a goalless draw against Bari last night. Capri has a relatively small budget, and a payroll that fails to exceed 3 million euros making what they have achieved, something of a miracle. Despite this high achievement, manager Cristiano Giuntoli insists that the clubs philosophy will not change; Carpi will continue to focus on youth players, and will engage fans by utilizing home – grown players. HISTORY HAS BEEN MADE TONIGHT AT THE NOU CAMP!!! After a 6 – 0 win over Getafe arguably one of the greatest strike forces of all time, d espite their short time together, surpassed the 100 goal tally for the season. Lionel Messi, Luis Suarez and Neymar de Silver Santos Junior all scored tonight to reach the tally within 30 minutes of kick off. Messi scored the opening goal from the penalty spot, and then Suarez doubled Barcelona’s lead on 25 minutes with a neat volley. 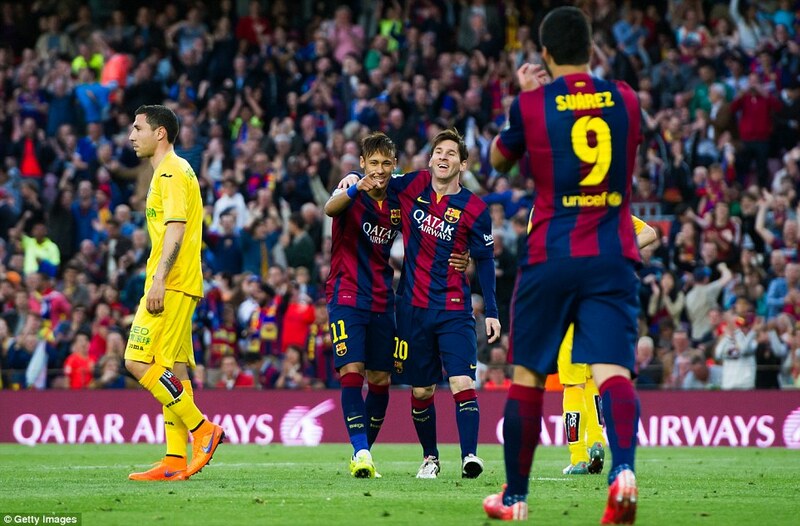 Three minutes later Neymar joined the party, as the three amigos put on a show for the home crowd. Xavi scored the fourth goal on this his 501st appearance for his boyhood club. Suarez scored his second just before half time, and the magnificent Lionel Messi ended proceedings with his second goal of the night. This victory leaves Barcelona leading the La Liga table 5 points ahead of rivals Real Madrid, who play on Wednesday night against Almeria. Barcelona look on course to regain their first La Liga title in three years. MSN (Messi, Suarez, Neymar) have now scored a collective tally of 102 goals in all competition. This record has surpassed the previous 99 goal tally set by Samuel Eto’o, Thierry Henry and Lionel Messi during the 2008 – 2009 season. Last season Real Madrid’s Karim Benzema, Cristiano Ronaldo and Gareth Bale came oh so close to beating the record set in 2008 with 97 goals, but unfortunately it was not enough and it will take something very special to beat the record 102 goals set by this exceptionally talented Blaugrana strikeforce. 31st March 1928. Some 87 years ago, Scotland played England in the British Home Championship at a packed Wembley Stadium (80, 868). Scotland in their previous two fixtures had lost 1 – 0 to Northern Ireland, and drew 2 – 2 with Wales. England also failed to get off to a successful start losing to both Northern Ireland and Wales. Despite Scotland being a point ahead of the ‘Auld Enemy’, the Scots still feared they would finish bottom of the table facing the challenge of beating England, the previous winners of the British Home Championship, on home soil. If the thought of facing the previous winners wasn’t fearful enough, the team selection certainly was. Left out of the 11 man squad were Davie Meiklejohn (Rangers FC, 409 app), Jimmy McGrory (Celtic FC, 378 app and 395 goals), Bob McPhail (Rangers FC – record of 230 goals only to be beaten by Ally McCoist in 1997) and Willie McStay (Celtic FC, 4 League titles and 3 Scottish Cups). These players were considered as HOME SCOTS, players who were Scottish who played in the Scottish Football League. The players that were favoured were the ANGLO SCOTS, Scottish players who played their football around other parts of Britain. In place of the HOME SCOTS were 8 Football League players. One of which was Tom ‘Tiny’ Bradshaw who would be making his Scotland debut at Wembley against the famous Dixie Deans. Dixie made 399 appearances for Everton, scoring 349 goals. Scotland, inevitably, were deemed NO MATCH FOR ENGLAND! That was until the rain. It did nae rain but it POURED!! The rain was always going to favour the small Scots who could easily twist and turn away from the tall men of England. 3 minutes!! 3 minutes in and the Scots had taken the lead with an Alex Jackson header. Just before half time and the Scots went 2 – 0 up through an Alex James left footed shot. You wouldn’t believe what you were seeing. This was never meant to happen. Every pundit in the world would have put their granny on England to win! Even the Scottish fans! In fact some of them probably did. Jackson grabbed his second on the 65th minute, as did James in the 74th minute, and Jackson rounded off the hat trick in the 85th. England would end the game with a mere consolation goal. The game would finish 5 – 1 to the Scots. The Wembley Wizards had been born. Sadly this great team would never play together again and for Tony Bradshaw, despite keeping Everton’s son Dixie Deans at bay, it would be his only cap for Scotland. These players will forever go down in history as giving one of Scottish Footballs greatest ever performances in the dark blue. It was one of thee most remarkable victories of its time, and 87 years on it remains one of the Scots best victories against England. REMEMBER THE NAME. REMEBER THE HEROES.